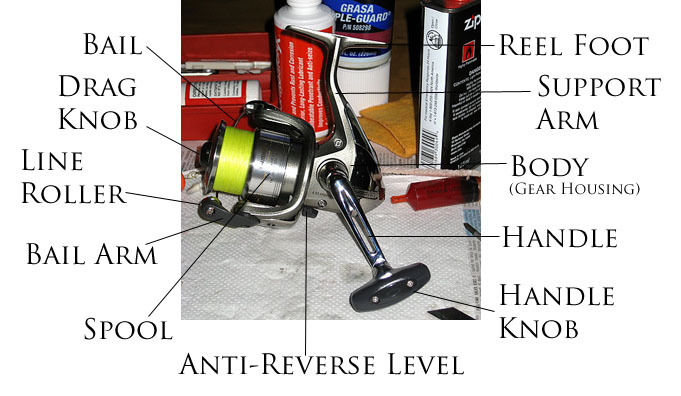 This is a diagram of the parts of a spinning reel. The bail is use to catch the line after casting. When you need to cast your rig out, you need to open up the bail by flexting the bail arm, to allow the fishing line in the spool to flow out freely. After you have casted, you close the bail arm and the bail automatically guide the line to the line roller. The line roller guides the laying of the line, during retrival of line into the spool. The drag knob is used to adjust the pressure of the drag. The spool is used to hold all the fishing line you need, the drag pads are also hosted inside the frame of the spool.The anti-reverse level when set to the "On" state, it only allows you to retireve line when you crank your handle, when it's in the "Off" state you can crank the handle the reverse way allowing line to be dispense out in theory. I almost never you this feature. The handle and the handle knob is use to crank the reel. The body houses the gears and bearings of the reel. The support arm link the body to the foot of the reel, it also provide a comfortable place for you grip the reel and rod with your fingers when fishing. And the reel foot is where you attach the reel to the reel seat on the rod.